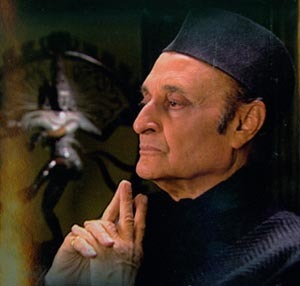 Currently the president of the Indian Council of Cultural Relations in New Delhi, Singh is the last Maharaja of Kashmir, and served as its governor for 18 years. He was a member of Indira Gandhi’s cabinet when she was prime minister, and has also served as Indian ambassador to the United States. Recognized as one of India’s outstanding thinkers and leaders, Singh is the author of numerous books and has lectured widely--both in India and abroad--on political science, philosophy, education, religion and culture. 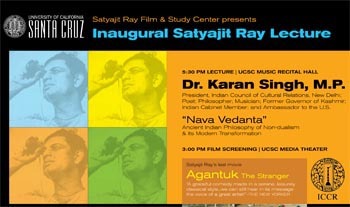 The lecture will be preceded by a screening of renowned Indian Director Satyajit Ray's last movie: Agantuk (The Stranger) at 3 p.m. in the UCSC Media Theater. The lecture and film screening are presented by The Satyajit Ray Film and Study Center (Ray FASC)--a research center in the Humanities Division at UC Santa Cruz. The center is dedicated to the preservation of Satyajit Ray's cinematic, literary and artistic work. Under the direction of founding director Dilip Basu, Ray FASC has a collection of 32 of Ray’s 36 films, including 22 fully restored prints. The restoration work is conducted at the Academy of Motion Picture Arts and Sciences in Los Angeles—the same academy that honored Ray with a special Oscar in 2002 for his lifetime achievements as a filmmaker. Basu noted that film prints from Ray FASC are now screened at major museums and film festivals around the world. Basu noted that Ray FASC also hosts scholars, students, and film makers who visit its facility for research and study. A professor of history at UC Santa Cruz, Basu also teaches an annual upper division class titled "Cinema and History: Film Author Satyajit Ray."